An artist's illustration of the JUpiter ICy moons Explorer spacecraft in the Jovian system. The mission will launch in 2022 and arrive at Jupiter in 2030 to study the planet and its largest moons. An ambitious European mission that will launch a robotic probe to explore Jupiter's icy moons in 2022 has got its science gear. 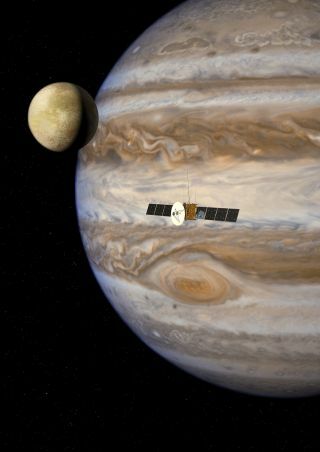 The European Space Agency has picked 11 instruments for the planned JUpiter ICy moons Explorer, or JUICE, spacecraft. The mission is expected to reach Jupiter, the largest planet in the solar system, in 2030 and spend at least three years studying the gas giant's major moons Callisto, Europa, and Ganymede. The Jovian satellites are intriguing to scientists because they are thought to have vast oceans beneath their icy outer crust. "Jupiter and its icy moons constitute a kind of mini-Solar System in their own right, offering European scientists and our international partners the chance to learn more about the formation of potentially habitable worlds around other stars," said Dmitrij Titov, JUICE study scientist for ESA, in a Feb. 21 statement. The spacecraft will eventually end up orbiting Ganymede, the largest moon in our solar system, to study its surface and internal structure. Ganymede is also the only known moon in the solar system with its own magnetic field, and JUICE will closely observe the moon's interactions with Jupiter's magnetosphere, ESA officials said. The collection of approved instruments to help scientists complete these tasks includes cameras, spectrometers, a laser altimeter and an ice-penetrating radar, as well as a magnetometer, plasma and particle monitors, and radio science hardware, ESA officials said. Teams from 15 European countries and the United States and Japan will develop the tools. "The suite of instruments addresses all of the mission's science goals, from in-situ measurements of Jupiter's vast magnetic field and plasma environment, to remote observations of the surfaces and interiors of the three icy moons," Luigi Colangeli, coordinator of ESA's solar system missions, said in a statement. "NASA is thrilled to collaborate with ESA on this exciting mission to explore Jupiter and its icy moons," said John Grunsfeld, NASA's associate administrator for science in Washington, in a statement. "Working together with ESA and our other international partners is key to enabling future scientific progress in our quest to understand the cosmos." While the JUICE mission will launch in 2022, NASA currently has another spacecraft en route to the giant planet. The Juno spacecraft launched in 2011 and is expected to arrive in orbit around Jupiter in July 2016 to study the planet's magnetic field and peer through its cloudy atmosphere. JUICE and Juno are the first missions dedicated to Jupiter exploration since NASA's Galileo mission from 1989 to 2003.